It seems that craftsmanship is tied to honesty and integrity. I don’t consider myself an artist but I do create and make taking raw materials and transforming them with intention. It is a wonderful learning experience. With each new making, I learn so much. My skills improve. The hand work becomes second nature through repetition. This is why it is so powerful to work with a production of like items. I am working on a run of Arts and Crafts candlestick holders, 16 total in three wood species. I also am working a production run of 3 Arts and Crafts mantel clocks. Both these projects are of original designs I designed ten or more years ago. I hope to post pictures and stock them in my online shop. In the past week I came across a Facebook post on a spoon carving group of a “art” spoon out of Amboyna Burl. Jarrod Stone Dahl posted a comment that has stuck with me. I’ll have to paraphrase because I can’t find the post again. ‘That is a poorly designed spoon. It fails as a spoon and in the future when the jazzy color of the burl is all faded it will be worthless.’ It was really a scoop with the leading edge of the bowl radically up turned and ending in the natural edge of the burl. The rest of the scoop was wonderful with two apposing hearts making up the handle. Jarrod’s comment reminds me about craftsmanship. One deviation into the world of art and a work becomes unusable. It probably would be better of left as a tree. Next week in the shop I plan on finishing the candlestick production, work on a book shelf for a real narrow space in the kitchen, make a welding cart. Finished Peter Korn’s book “Why we make things and why it matters” tonight. It was a wonderful read which I can fully and hardily recommend to anyone interested in living a ‘good’ life and making things. He eloquently weaves a narrative that has making things as the warp of a canvas with common daily activities threaded throughout to produce what a feeling of goodness. He describes three types of makers. First person, the original maker. Second person, a person experiencing the maker’s craft. Third person, the writer, critic, magazine - anybody viewing a facsimile of the object. Each has a place in the work. He describes the work of a maker as the shaping of a culture, little by little. A maker either reinforces or pushes the boundaries of what is considered normal in a culture. If the maker is a little out there, then the second and third person in this chain can reinforce or not, the makers notion. This is how design evolves. This book is also an autobiography. Peter thought early on, that being a master craftsman meant that you’d be enlightened. And so went his search for meaning. But Peter so found out and shared that some master craftsmen are a-holes. Really what he was searching for was a good life. Something we all are after. We create our little part of the world each day. Each choice we makes adds up to our life. We are both a maker of things and a maker of our life. Great writing and a great narrative. this I’ll defiantly reread. My illness is preventing me from being in the shop being a maker. I love making things. I do a mix of my own stuff and copying what I see around me. Even when copying others designs and ideas, I impart a little of my own sensibility, sometimes to a positive affect sometimes not. While I can't get in the shop to make, I can read and write about the maker ethos. 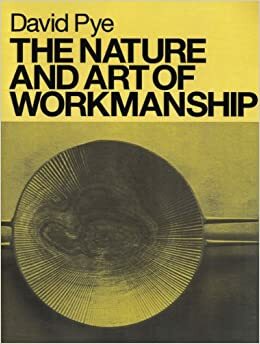 Reading David Pye’s book The Nature and Art of Workmanship. I noticed that he was not comparing Art and Craft (he calls craftsmanship - workmanship). He looks at workings of workmanship. He uses a few terms to define the art of workmanship. I find these helpful in thinking about what I do. I tend to favor in my work a Free Workmanship of risk. He is careful not to disparage Regulated work or in some instances Workmanship of certainty. Each type of workmanship has its place. Like a scientist, he provides examples for his assertions unlike John Ruskin and William Morris, two influential figures in transition to modern workmanship. These writers railed against regulated workmanship of certainty. But according to Pye, they invoked Christianity as reason not to do regulated work. All there pointing to the harm that regulated workmanship of certainty caused was not backed up in reality. Pye points out gaps in their ideas. One more chapter to go The aesthetic importance of workmanship, and its future.